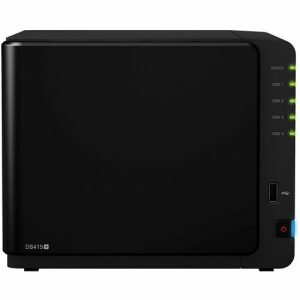 The DS414 DiskStation Diskless 4-Bay SMB & SOHO NAS Server from Synology comes equipped with four hot-swappable storage bays capable of holding both 2.5″ and 3.5″ SATA II and SATA III hard drives and solid state drives. With support for capacities up to 16TB (drives sold separately), you can store a large amount of files including Full HD video, music, photos, documents and more. This enclosure supports enhanced data transfer speeds with an average data write speed of 135.6 MB/s and an average data read speed of 207.07 MB/s. 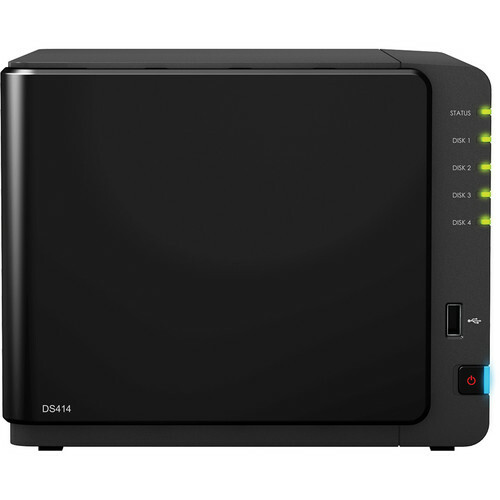 The DS414 NAS Server from Synology comes equipped with a 1.33 GHz Dual Core processor and 1GB of DDR3 RAM to maintain efficient data transfer speeds. 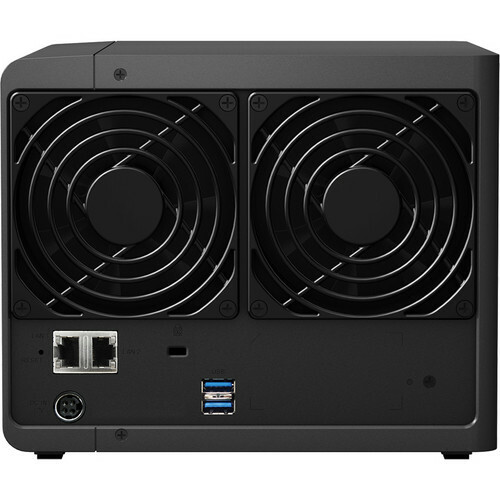 With two USB 3.0 ports and one USB 2.0 port you can connect this enclosure to your Windows, Mac or Linux based system. This enclosure can also be connected to the Internet via the included dual Gigabit Ethernet ports making your stored data available to users throughout the network. Files can also be made available remotely through the free iOS and Android applications. 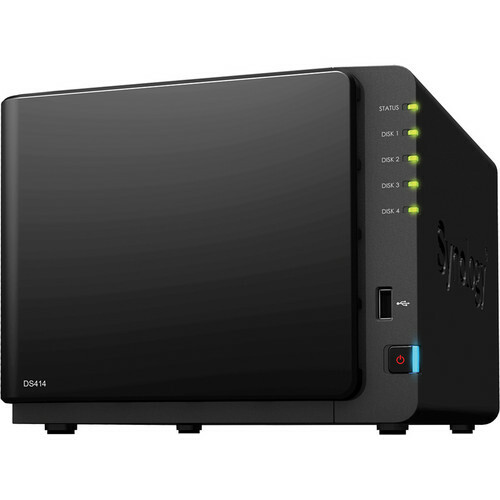 The Synology DS414 features a built-in floating-point unit within the CPU, 1GB RAM, dual LAN connectivity , SuperSpeed USB 3.0 and tool-less HDD trays. The built-in floating-point unite enhances the overall capability of the main CPU to enable higher working efficiency. Under link aggregation, DS414 delivers over 135.6MB/sec writing speed under RAID 5 configuration in a Windows environment, and over 207.07MB/sec reading. Designed with attention to recovery mechanism, the DS414 comes with dual LAN failover support to ensure continual network service in case of LAN failure, while hot-swappable design facilitates easy hard drive replacement. For friendly and effortless hard drive installation, the DS414 contains tool-less hard drive trays, allowing users to fixate 3.5″ hard drives without a screwdriver. External storage access is made fast and easy, with two SuperSpeed USB 3.0 interfaces in the back, alongside one USB 2.0 interface on the front panel for quick access. 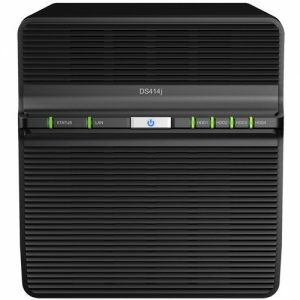 Synology DS414 offers comprehensive network protocol support, assuring seamless file sharing across Windows, Mac, and Linux platforms. Windows AD and LDAP integration allows Synology DS414 to fit quickly and effortlessly into any existing network environment, with no need to recreate user accounts. Internet file access is simplified by the encrypted FTP server and the web-based file explorer, Synology File Station. HTTPS, firewall, and IP auto-block support ensure file sharing over the Internet is protected at a high security level. 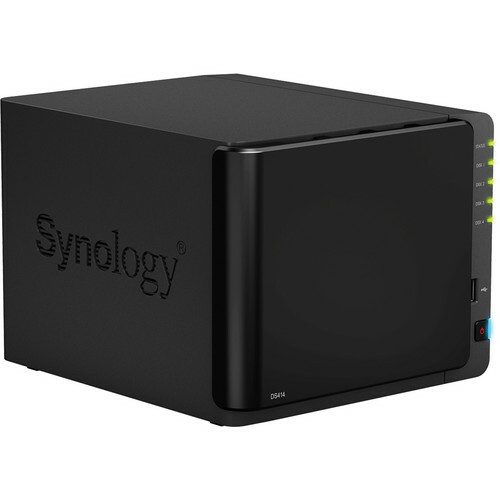 The Synology DS414 offers a centralized backup target to consolidate fragmented and unstructured data across a network. PC users can back up their data to the Synology DS414 using Synology Data Replicator software, and Mac OS X users enjoy native Apple Time Machine integration. 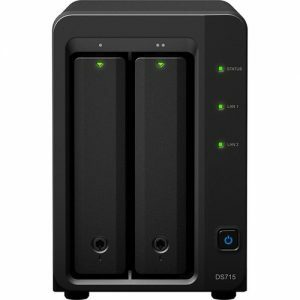 A backup wizard is provided for backing up data from the Synology DS414 to another Synology NAS, or to an external drive. Backing up to Amazon S3 and Glacier cloud service is also supported. The add-on package, Time Backup, keeps DiskStation data in multiple versions, so IT administrators could easily keep track of them and restore them to a previous version whenever required. Shared folder sync allows users to synchronize a specific folder from Synology DS414 to another DiskStation – a server-to-client backup mechanism that takes place whenever something is changed on the server side. Users will be able to share documents within their local office seamlessly and safely with encrypted connection. When your DiskStation is down, you will be able to have an immediate backup running in no time. The Synology DS414 runs on the Synology DiskStation Manager (DSM), which offers comprehensive applications and features designed specifically for office and business workgroups. Cloud Station allows users to sync files among devices, including Windows PC, Mac, Linux, iOS, and Android tablets or phones, effortlessly keeping everything up-to-date. 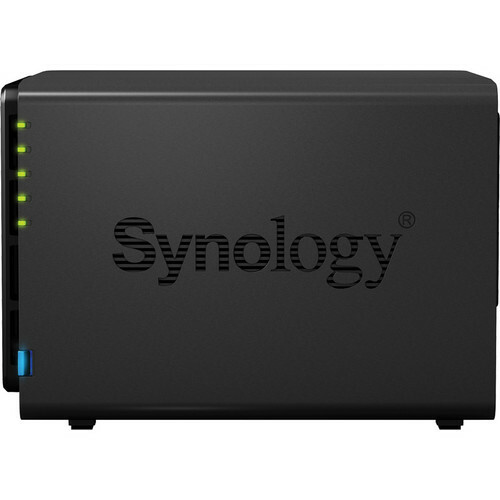 The Mail Server package turns Synology DS414 into a dedicated mail service provider, while Mail Station, provides a webmail interface for users to access emails stored on Synology DS414. 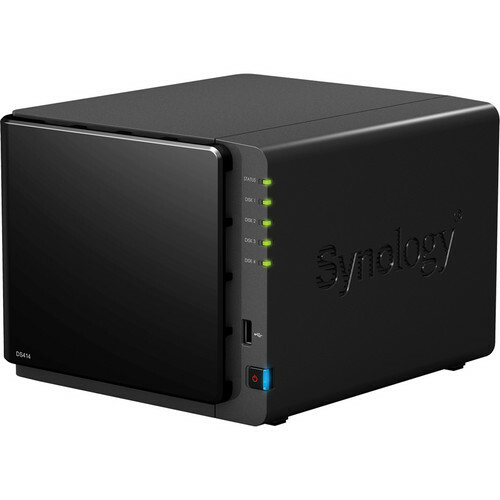 VPN Server package offers an easy VPN solution that turns your Synology DS414 into a VPN server, providing a secure way of connecting to a private LAN at a remote location. RADIUS Server strengthens network security by overseeing wireless access authentication via the RADIUS (Remote Authentication Dial-In User Service) networking protocol. As to environment security, Synology Surveillance Station offers a centralized interface to manage IP cameras deployed in your office or home, allowing users traveling miles away to safeguard the environment by watching live views, recording events, and taking snapshots with a computer or iOS/Android devices. 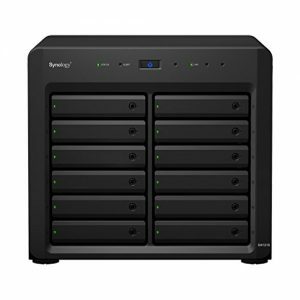 All Synology NAS devices are designed with energy efficiency in mind. Not only does the DS414 provide two 92×92 mm fans and the smart airflow to keep the system running cool 24/7, its noise dampening design makes it really quiet compared to PC counterparts. The support of Wake on LAN/WAN, multiple scheduled power on/off can further reduce power consumption and operation cost. Additionally, all Synology products are produced with RoHS compliant parts and packed with recyclable packing materials.